Being an author has been my dream since I knew how to hold a crayon. As a little girl I used to write silly fairy tales and funny love stories for my sisters. But I didn’t think writing a novel could be possible for me. At the time I had one child (now I have two!) and a job, how would I ever find the time? And, although I had worked as a journalist and a copywriter so I knew how to write, I didn’t know how to structure a novel. But still, that little seed had been planted and it started growing. I wanted to make my life-long dream come true so I started sketching out an idea for a novel, writing down that could happen, what my characters would be like. I read other authors’ books, analyzing how they’d structured their stories, what their plots looked like. It became a New Year’s resolution for me, one I was determined I’d actually make happen – publish a book that year. I worked on my book every spare second, then sent it out to numerous agents. There were a lot of rejections – 51 before I stopped counting – but after each one I fine-tuned, edited, and sent out to more agents. And in December 21, 2011, my dreams came true. I was offered representation by an agent. I was deliriously happy. My husband brought home champagne and as I watched the bubbles pop and spill over the edge of the bottle, I thought I’d never been happier. In fact, I felt a little smug that I’d actually managed to keep my New Year’s resolution. But then: disaster. My book had been on offer for about a month when my agent called to say that no publishers had bought it. They all said basically the same thing: I could write well but it just wasn’t marketable enough. When I took the call I was standing outside a retirement home near where I lived in London. My knees felt weak and had to sit down on the sidewalk. Tears burned in my eyes and I looked at that retirement home and thought, ‘What if I’m old before this ever happens?’ Every dream I’d thought had come true burst like those champagne bubbles. My agent assured me it was fine; she’d help me write a new book and we’d try again. So I sat down to write a second book, but when I finally sent her the finished second novel, she didn’t like it and said she couldn’t submit it. I was devastated. Another year had come and gone where I’d been collecting seconds to write like a squirrel stores nuts, and still I hadn’t fulfilled that New Year’s resolution. Of course, by this time it had gone from being a resolution to a fierce desire burning inside me. I decided I was going to publish a book no matter what. My agent and I went our separate ways and I started researching ideas for a third book. Meanwhile I started writing rhyming children’s stories with themes like patience or acceptance for my boys and I self-published them on Amazon. But I still wanted that novel. In 2012 I became pregnant. I have a condition called hyperemesis gravidarum and was so sick, beyond just morning sickness-sick. It was horrible and also meant my third book was delayed by another year. But in 2013, a few months after I’d given birth, I read a story in the news that changed everything. A 13-year old girl in California named Jahi McMath had gone into surgery to have her tonsils removed, suffered massive blood loss, and ultimately was declared brain dead. Having a new baby, this was the worst story I could have possibly read. It resonated with me on so many levels. I looked at my newborn baby utterly horrified and thought about Jahi’s mother, how devastating it would be to hold your child in your arms, watch her take her first steps, go to sleepovers, become a teenager, and have her be so savagely ripped away. From that story the seeds of The Night Olivia Fell were sown. I finished the book in 2016, took a Writer’s Digest course on how to pitch agents, rigorously researched who I wanted, then sent it out to just five. Three asked for a full manuscript. Within a few weeks I’d signed a contract with Carly Watters at P.S. Literary Agency. I was delighted, but tentatively so. I’d been here before, after all. My agent was wonderful. She gave me insightful tips for polishing and editing, and I worked every weekend and evening after work to get the book done, my husband heroically watching our kids while I pulled 60-hour weeks. In January of 2017 Carly sent it out to publishers. I’d missed another New Year’s, but I was hopeful that this would be my year. There were a few rejections at first, and I started spiralling into a mini depression. I regretted even trying. I swore I’d never write again if this failed. “It only takes one yes,” Carly told me, and I truly felt better after that. In spring of 2017 my book went on a two-way bidding war and I got to pick my publisher. I signed with Simon and Schuster’s Gallery imprint because Kate Dresser, the editor, had such remarkable vision I knew she’d make it even better. Of course, my story doesn’t end there. What I’ve learned is, you’re never totally done publishing a book. There are line edits and copy edits and cover designs and delays to publication and marketing. 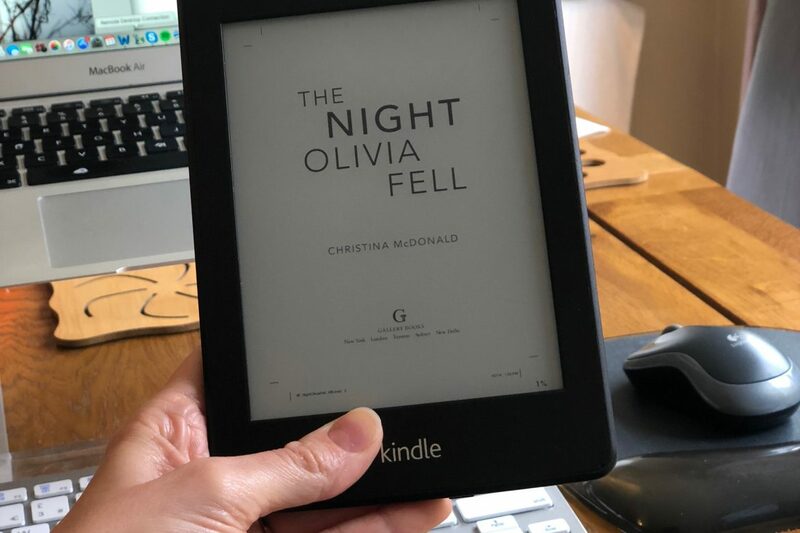 The Night Olivia Fell is now due out winter 2019, just over eight years after I started writing my first book and almost three years after signing with my agent. So maybe I didn’t make my New Year’s resolution in time, but I persevered. I guess I made a life resolution after all. I think maybe that’s even better.